With BCCI getting into a lot of hammer and tongs, it is high time necessary actions are taken to clean the mess created in the cricketing scene. 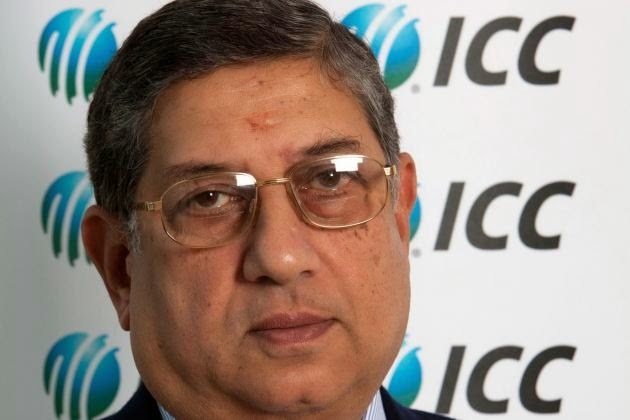 The Supreme court has asked Srini mama to step down. Meiyappan must be laughing his bowels out now after hearing this news. Supreme court has also axed Rajastan Royals and Chennai Super Kings. But if you look at this picture of Srini mama, would you believe that he is a culprit? He has a milk flowing face . If he wears a saree, he would look like the Tamil CM Amma. There are suggestions going around the cricketing circle that Sunil Gavaskar should be made as the Chief of the BCCI. He is not like Sreeni maama to just hold on to his post. Gavaskar can walk out any moment he feels like doing so. He has walked out of matches in the past too. 1) Srini maama should be made to go through the newshour debate by Arnab Gowsami. It will be mutual punishment for both. Subramaniam Swamy should also feature in that debate. He will prove that Srini maama's son in law is Rahul Gandhi and not Meiyappan. 2) Instead of making Gavaskar as the BCCI president, they should appoint Sunny Leone as the BCCI head. There will be lot of transparency in BCCI. 6) Ashish Nehra should be banned from cricket. He bowls the last over for India; India loses. He went to Pune Warriors, Pune Warriors went out of IPL. Now he was selected for CSK; CSK is scratched. He should be sent to Pakistan now. 9) Shashi Tharoor , Lalit Modi would be having a whale of a time now. Sreesanth would be dancing in his bathroom too. So please vote for Narendra Modi. 10) To Hell with BCCI. Let us go and play kabbadi! lol. good one.. like your suggestions!! I never thought i will connect to anything related to cricket...!! !